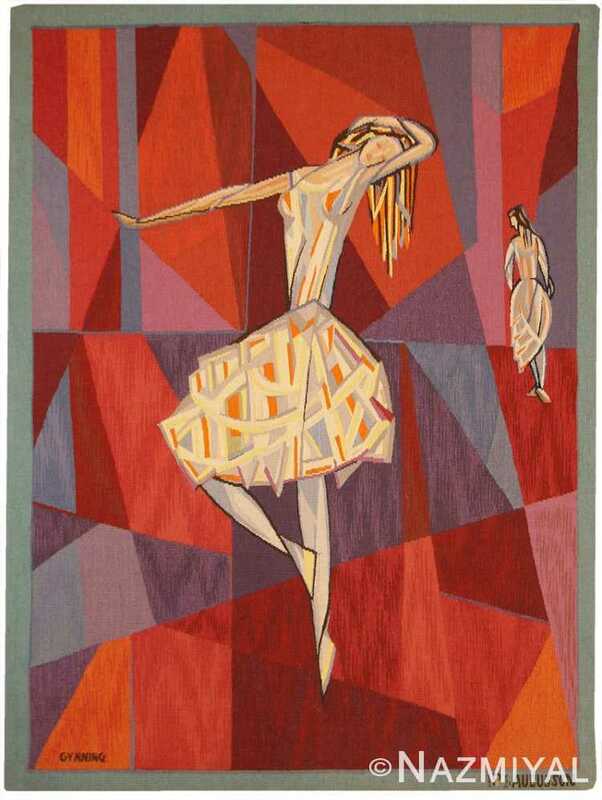 Lars Gynning Tapestries and Rugs – Affectionately called Monsieur Bleu, Lars Olof Gynning (1920-2003) was a successful Swedish painter and textile designer who trained in Europe and rose to fame in France. After completing his studies, Gynning began his most notable role as a designer with the Pinton Freres atelier, which has been operating in Aubusson since 1867. 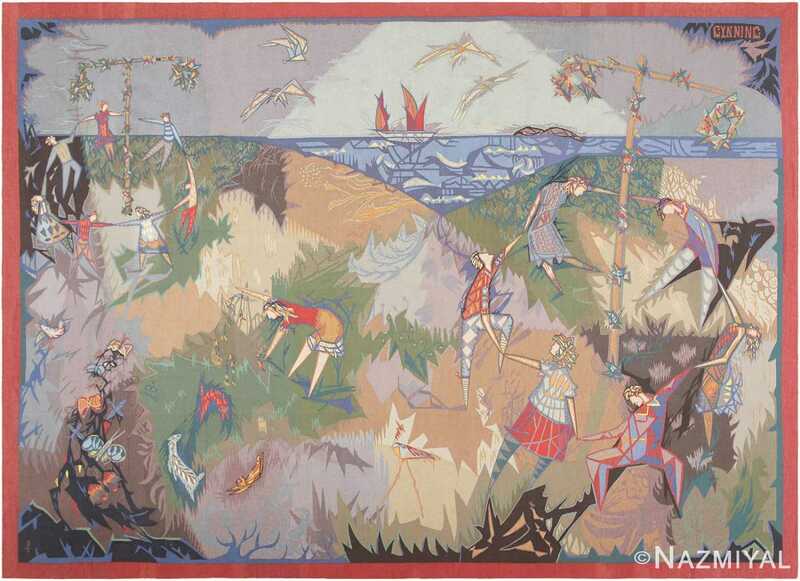 This atelier was instrumental in modernizing and reviving tapestries as an art form by featuring works from great 20th century artists, including the amazingly inventive Jean Lurcat. It was Lurcat who sparked Gynning’s fascination with textile design and led to Gynning partnering with the Pintons in the 1940’s. Lurcat was an influential figure who worked with Gynning and inspired him. However, Gynning steadily developed a distinctive and original style that frequently included his signature muted blues, which prompted the nickname “Mr. 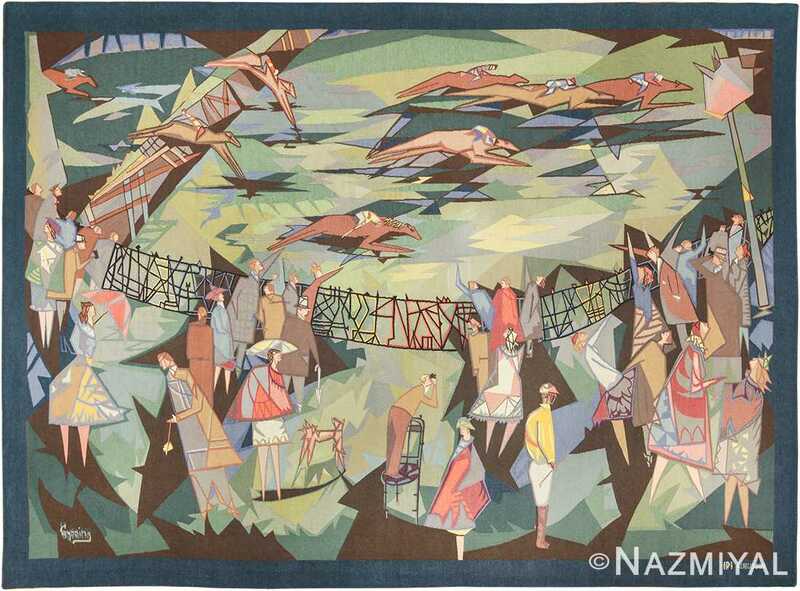 Blue.” During his long, productive career, Gynning produced approximately 250 original rug and tapestry designs that were hand woven by Pinton Freres’ weavers in France. The artist’s contemporary cubist-influenced style, which features richly textural geometric shapes and jagged crystalline structures, earned him a strong following in his home away from home. In the mid-1960’s, Gynning spent time in Stockholm attempting to develop a career as in art dealer in Stockholm. During this time, he founded Gallery Blue, which he turned over to a colleague in 1972 to continue being a full-time artist. Lars Gynning has a distinctive yet versatile style, and his tapestries feature a wide variety of subjects ranging from mythical scenes to landscapes, single-subject portraits and entirely abstract compositions. The artist’s works are typically signed Lars Gynning, L. Gynning or L.O.G. Those woven in Aubusson also bear the ‘PF’ mark associated with the Pinton Freres atelier.